Having slaughter as a disposal option makes it far too easy for people to abdicate their responsibilities, and having commercial operations ready to pay for "surplus" horses only adds incentive to treat the animals like commodities instead of companions. We are all confronted with circumstances - our own and others' - where we question how and why certain things come to be. For animal advocates, it's particularly true when we see other creatures suffering and we don't know what, if anything, we can do about it. Two current events illustrate how this adage applies when it comes to preventing animal suffering and death. The first involves the deaths of 174 Florida manatees in the last six months. Although these peaceful giants are constantly threatened by boat traffic, this time the danger appears not to have been human-based. The natural phenomenon of red tide - a toxic algae bloom that has occurred regularly for centuries in the Gulf of Mexico - causes the manatees to sicken, weaken and die. Florida health officials say pollution does not cause red tides (although changes in the algae blooms should be investigated). Human rescuers have tried to help some of the ill manatees, but most could not be saved. For a species already imperiled, it is another blow to their survival. In New Mexico, however, a threat to thousands of other animals is entirely preventable. There, despite opposition from the governor, the Valley Meat company is asking the USDA to let it start killing horses for the first time since Congress lifted a horse slaughter ban in 2011. Slaughter proponents - including some so-called "horse people" - say that killing horses in the U.S. is the lesser of two evils, compared to hauling tens of thousands of horses to Canada or Mexico, whose slaughter standards are even worse than what the U. S. used to permit, which was by no means humane. It's a debate going on in several states, mostly out west, with horse advocates pushing back. But the lesser of two evils is still evil, and allowing horse slaughter to resume ignores two major sources of the problem: the overbreeding of horses for commercial and recreational purposes and the failure of horse owners to euthanize or retire (rather than dump) injured, sick, retired or otherwise unwanted horses. Having slaughter as a disposal option makes it far too easy for people to abdicate their responsibilities, and having commercial operations ready to pay for "surplus" horses only adds incentive to treat the animals like commodities instead of companions. A bipartisan group of federal legislators has introduced the Safeguard American Food Exports Act (SAFE) in the House (H. R. 1094) and Senate (S. 541) to permanently ban the slaughter and export of horses for human consumption. 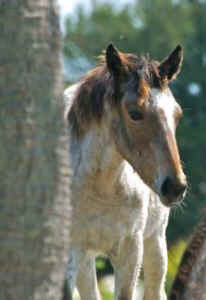 If successful, it will end the slaughter debate and close a legal loophole that has become a noose for exported horses. If additional horse sanctuaries need to be established, perhaps a slight increase in grazing fees would be appropriate, since cattle and sheep ranchers (who still use horses) have been allowed to displace wild horses from their historical ranges. The key is to always look for a solution to animal cruelty and suffering. Sometimes it's legislation, sometimes it's direct intervention, sometimes it's boycotts or protests or letters or petitions. But we should always ask ourselves what we can do individually and collectively before we accept that something harmful is inevitable or insurmountable. There will always be times when we must accept circumstances for what they are. But we refuse to accept needless cruelty, and if enough people use their wisdom to change the things they can, more animals can enjoy some serenity.